Picture this traditional scene – It’s 1970 and parents of a newborn arrive at a “welcome home” barbeque for the new family at the home of the mother’s parents. Within minutes, the new baby is passed from one set of arms to another. No surprise to any of our readers, it does not take long before the newborn tires and starts to turn away from all the attention. These early cues are ignored until the newborn begins to cry loudly just as he is handed to his grandfather. With a knowing smile, granddad says “looks like this little guy needs his mama” and stiffly hands the fussy baby to his daughter. Knowing smiles pass among the women at the gathering and someone declares that men are “just hopeless” with babies. For many generations, men’s roles in child rearing have been delegated to the sidelines. Men were expected to step into the action only when women were too tired, too stressed, or occupied with other responsibilities. Traditionally, men have played more of a utilitarian role as diaper changers and secondary feeders, leaving the bonding, emotional connection, and comforting to mothers who were expected somehow to intrinsically know “just what to do” when their babies needed them. While this blog is far from “an instruction manual,” we hope that we have added to dads' knowledge and skills, helping them to understand the value of their interactions with their infants. In our imaginations, we hope our readers would experience a different scene unfolding versus the one described at the start of this post. Todd and Jill arrive with their newborn, Sam, at Jill’s parents’ welcome home barbeque. Todd and Jill are very familiar with Sam’s disengagement cues and they know that Sam has a particular problem with overstimulation when he is already drowsy. They have come prepared with a plan to minimize stimulation if Sam show’s signs of tiring. Todd carries Sam into the party confidently and proudly. As Jill reconnects with family and friends, Todd keeps a casual but sharp eye on Sam’s reaction to each new relative, pacing new contacts slowly. As Sam begins to tire, Todd explains to the group about the baby’s cues and knowingly takes the irritable Sam from his grandfather’s arms before he starts to cry. Of course, in our dreams, everyone at the party has the same baby behavior skills and Todd’s perceptions are not even noticed as out of the ordinary! We’d love to hear from dads if they have had any experiences like those we’ve described, particularly if you have been dismissed as knowing nothing about infants or (what we hope) embraced as the “baby psychic” in the family. Next time: Let’s Talk about Twins! Fägerskiöld A. Support of fathers of infants by the child health nurse. Scand J Caring Sci. 2006 Mar;20(1):79-85. Premberg A, Hellström AL, Berg M. Experiences of the first year as father. Scand J Caring Sci. 2008 Mar;22(1):56-63. Fägerskiöld A. A change in life as experienced by first-time fathers. Scand J Caring Sci. 2008 Mar;22(1):64-71. For the first time ever, women make up the majority of the workforce; 4 out of 10 mothers are now the primary breadwinners in their families. Whether it’s the result of the economic downturn or a personal family choice, there are currently about 158,000 SAHDs (Stay-At-Home dads) in the United States, and that number has almost doubled in the last 10 years. We wanted to write a post dedicated to stay-at-home dads to support them in understanding their babies’ behaviors. Of course, all of this information applies to stay-at-home moms as well. I wrote this post, not only in response to the shift in family structures that has affected thousands of families, but because it has touched my own family. Exactly one year ago, my husband was laid off from his job as the building industry plummeted. Ever since then, he has stayed home to care for our daughter, now almost 3 ½. Unexpectedly, my husband has become the primary caregiver of our daughter while I spend my days at work or traveling across the state to share Baby Behavior messages and my evenings in graduate school. Through all of this, I think I’m the luckiest mom in the world because wherever I am, I know that my daughter is with the one person in the world that loves her as much as I do, her daddy. So, for all of you SAHDs caring for babies, we would like to offer 5 tips to help you in your parenting journey. There is no doubt that parenting is the hardest job in the world. Even though this is the first time we’ve written an entire post dedicated to stay-at-home dads, we hope that many of our other posts also have been useful to you! These days, many working dads play a large role in parenting their children. As primary caregivers, stay-at-home dads play an even larger role, but both working and stay-at-home dads can become experts about their babies’ behavior. In the beginning, as with any new relationship, there is an adjustment period, but it won't take long before you too can create your own special language with your infant. Understanding your baby’s behavior may seem complicated, but it can’t be too difficult or how would babies ever survive? We encourage you to read or re-read the original 4 Baby Behavior Basics posts to help build your confidence in caring for your baby. Babies feel calm and secure in knowing what to expect each day. Simply keeping a predictable daily structure each day will help you and your baby develop similar rhythms. However, please don’t confuse “routines” (patterns of actions, or doing the same thing in the same order) with “schedules” (actions dictated by the clock rather than baby's needs). We are proponents of the former rather than the latter. Instinctively, most parents settle into routines at bedtime, bath time, and when feeding their babies. For more information about the power of routines, click here. While we realize getting out of the house with an infant can be quite challenging, fresh air can do wonders for you (and your baby) after being stuck inside the house all day. Getting out of the house can be as simple as just running an errand or taking a walk around the block, and will give you and your baby a nice break. Since nap times will vary from baby to baby and your baby’s age, try to plan outings during your baby’s most alert and rested times of day. For the trips with your baby that take you outside of your area code, read this post. Have you ever noticed the large number of mommy groups and play groups run by women? That’s because it takes a lot of support to raise children. These days, families are more isolated than in the past. Many couples do not have family nearby to provide support and some SAHDs may find that their own parents are not accepting of their new role. SAHD groups are on the rise; New York City has a very active dad’s group that was created in 2008 and now has over 200 members. Check the internet to find a dads group near you or plan “play dates” (you can call them something else!) with other SAHDs you meet while you are out with your baby. Make time (probably through negotiations with your significant other) to do things you like to do to relieve stress and give yourself a break. You’ve probably heard the adage: if you don’t take care of yourself, you can’t take care of others. It’s cliché but true. From experience I can testify that taking a break will allow you to return home refreshed and ready for another round of diaper duty or peek-a-boo. One thing I’ve learned from life with my husband at home is that children’s experiences with SAHDs may differ quite a bit from those they would have with stay-at-home moms. My daughter’s dance and t-ball skills are way beyond what I could have taught her. She also has no fear when she rides her tricycle down our steep driveway with the wind in her hair, smiling from ear to ear. I probably never would have let her have that experience more than once! While our situation didn’t work out the way we planned it, we’ve all learned and benefited from our arrangement. We know we’re not alone in working things out this way. And neither are you! There’s no doubt that stay-at-home moms and dads need tools to help deal with their many adventures while parenting. Let us know what questions you have and we’ll do our best to find the answers for you. The following is a "guest post" from our ever-energetic Taryn Barrette. Though not yet a parent herself, Taryn is a registered dietitian (and proud cat-owner) on our staff who is rapidly becoming a baby behavior specialist. 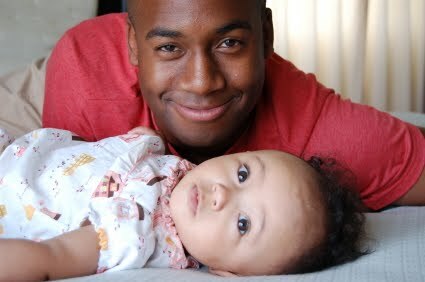 I always laugh when I hear my boyfriend talk to babies. He’ll say things like “Hello, George. How are you doing today?” in his most grown-up, monotone voice. In an earlier post, we talked about how babies respond to “baby talk” and that the repetitive, articulate, higher-pitched “motherese” draws babies’ attention and helps with infant speech and emotional development during their first year of life. We talked about how younger infants make sounds to communicate, and then starting at around 6-10 months of age, babies begin to use signs along with sounds. Eventually, towards the end of the first year, babies start to use words. So we know that “baby talk” is vital for infant development, but how is it beneficial for parents and how does it help parents’ relationships with babies? In a study conducted in Tokyo, Japan, researchers investigated differences between Infant-Directed Speech (IDS - aka “baby talk”) and Adult-Directed Speech (ADS - aka the monotonous voice my boyfriend uses with baby George). IDS shares similar characteristics with emotional speech, which is used when adults communicate emotions to other adults. Think of cooing, “I love you” to your significant other or using a higher-pitched, animated “Congratulations!” when your sister got promoted. Personality traits (i.e. extroverted vs. introverted) and gender can both affect the way and amount that adults use emotional speech; therefore, these differences may affect how adults utilize “baby talk” with their infants as well! The researchers used voice recordings of 256 words that were either spoken in IDS or ADS. Study participants were first time moms and dads of preverbal infants, mothers of toddlers and mothers of school-aged children or adults without any children. The participants’ brain activity was measured while they listened to the voice recordings. The scientists also found that extroverted mothers (women who are naturally more outgoing) were more likely to use “baby talk” with their infants. The more a mother uses IDS, the more her language centers of the brain are activated and the better she gets at using and processing “baby talk.” So, moms: keep talking to your babies! Even if other people give you a hard time, you are helping to improve your baby’s speech and at the same time molding your own brain to become more in tune with baby talk. Next time: Let’s Talk about Dads! We added a lot of new readers in the last few weeks and thought it was time, again, to orient people to our blog. As you know, we started this blog to demystify infant behavior for parents, family members, professionals, and students. We've relied on the recent explosion in scientific research on infants and young children to cut through the hype and report on the latest findings for our busy readers. If you are new to our blog, you might want to read the first 4 posts that cover the basics of baby behavior. You also can search on specific topics by finding the appropriate keyword on the left side of the page. For this tour, we thought it might be nice to refer our readers back to posts that might interest them based on the age of their babies. For expectant and new parents, you might want to read more about newborn development, sleep habits, and how some newborn behaviors can be misleading. We also have some posts about getting started with breastfeeding, dealing with sleep deprivation, and the importance of building a support system for those exhausting first few weeks. For caregivers and friends of young babies (from 6 weeks to 7 months), you should check out our posts on infant development from 6 to 8 weeks, 4 to 5 months, and 6 to 7 months. We've also shared posts on infant temperament, the power of repetition and routines in babies' lives, and starting solid foods. For caregivers and friends of older infants (up to 1 year), we have blogs and series of blogs on development from 8 to 10 months and 11 to 12 months, teething, infant sleep training systems (that was the series that got you all worked up! ), changes in infant sleep patterns over the entire first year, stranger anxiety, and language development. More recently, we've written on topics on older infants and toddlers, including their development from 12 to 15 months, 16 to 18 months, and into the second year, and tantrums. For caregivers of children of all ages, we've talked about traveling with your baby, visiting the doctor, naps, keeping "brave" babies safe, infant-family relationships, and making the most out of baby-gifts. After 130 posts, we can't list them all here. These links include only a sampling of what we've already covered. We look forward to sharing more about baby behavior with all of our readers. We'd love to hear from you. Let us know about new topics you'd like us to cover in future posts. Next time: A "Guest" Blog Post About Another Interesting Study! As we share information about Baby Behavior with more people across the US (and beyond) we find, without a doubt, one of the most controversial and engaging topics continues to be infant sleep. Parents are bombarded with information about how their babies should sleep and “sleeping through the night” continues to be regarded as a milestone to be achieved sooner rather than later. When I was new to motherhood myself (see “Thoughts from a Sleep Deprived Mom”), I was not prepared for how much my daughter would wake during the night and how little sleep she (and I) would get each night. While pregnant, I held the expectation that babies needed a lot of sleep and thus would sleep all the time (re member the phrase “sleep like a baby”? Where on earth did that come from?) Well, with my daughter’s birth came a huge wake up call: although babies do need a lot of sleep, they don’t necessarily need as much sleep as parents might think they do, and they certainly don’t consolidate their daily sleep needs into one nice 8-hour stretch during the nighttime...at least for awhile. To further shed light on this divisive topic, we would like to report some of the findings of a large study that looked at sleep patterns in children from age 1 month to age 16 years. As you read on, keep in mind that 1) Every baby is different and 2) An infant’s sleep can vary from one day to the next. For more information, click here to view our 4-part series about the Science of Infant Sleep. How many hours do babies sleep per day during a 24-hour period? Total hours of sleep decrease with age with 1 -month-old infants sleeping an average of about 14 ½ hours per 24 hour period and 18-month-old toddlers sleeping about 1 hour less per 24 hour period (~13 1/2 hours). 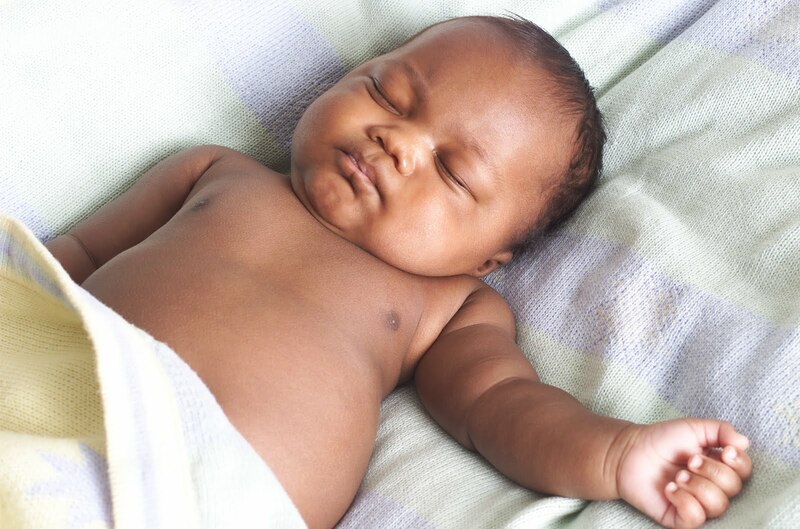 You’re probably wondering how your baby could possibly sleep LESS as he gets older, but what actually happens is that over your baby’s 1st year of life, his nighttime sleep consolidates into a longer stretch as his daytime sleep (naps) decrease. How many hours do babies sleep during the nighttime? Results of this study showed that the average one-month-old infant sleeps about 8 hours during the nighttime. (Note: this study reported nighttime sleep as time spent in bed.) By 3 months, babies spend about 10 hours per night in bed and this increases to about 11 ½ hours by 18 months. This doesn’t mean the average 1-month old sleeps 8 hours straight! It just means he spends 8 hours in bed total during the night. Information about number of night wakings was not collected. Average daytime sleep decreases gradually over the first year with 1-month-old infants napping a total of 5 ½ hours per day and about 2 hours per day by 18 months. Also by 18 months, a big change occurs as baby changes from 2 to 1 nap per day. Just a head’s up: some babies don’t like big changes in their routine and have a very hard time dropping their 2nd nap. I can remember several months of transition during this time where my daughter would be very grumpy the days she had just one nap but then up past my bedtime the days she took two naps. Here are the research findings for the average hours of daytime sleep for ages in between 1 month and 18 months: 3 months: ~5 hours, 6 months: 3.4 hrs, 9 months: 2.8 hours, 12 months: 2.4 hours. These days I’m looking forward to having a 2nd child, armed with the knowledge of how babies sleep and how their sleep patterns change over time. I think knowing what to expect makes us more confident as parents and less frustrated by our babies’ seemingly random behavior. I have one last finding to report: my daughter, now 3 1/2 does “sleep through the night” most of the time. There are a few little exceptions: when she is sick, when she misses her travelling mommy, when she hears funny sounds or has to get up to potty. Honestly though, I would rather her wake me for those things than find a nice wet present in her bed at 5am, and I often look forward to those crack of dawn snuggles when I’ve just returned home from two days away out of town. Following a recent post we received the following question: I know that I should put my baby to sleep on his back, but I am worried that if he spits up he will choke. Do you have any suggestions for preventing choking during sleep? Fortunately, studies also show that the increased prevalence of putting babies on their backs to sleep was not associated with an increase in deaths by choking. (6) Similar findings have been reported in other countries with recommendations similar to the US Back to Sleep Campaign, including England and Australia. Sleep with your baby in the same room. Having your baby near will help you hear if she needs you and will make it easier for you to respond quickly. Make sure your baby gets plenty of physical activity. By being able to move her neck, arms and legs, she will get stronger. Once your baby can roll over on her own, you should still put her down on her back to sleep. However, it’s ok if she rolls over while she sleeps, you don’t need to turn her back over. Keep your baby’s sleeping area free of pillows, blankets, and toys that could cover her face. If your baby seems to be spitting up or showing signs of reflux, talk to your pediatrician. 1. AAP Task Force on Sudden Infant Death Syndrome. The Changing Concept of Sudden Infant Death Syndrome: Diagnostic Coding Shifts, Controversies Regarding the Sleeping Environment, and New Variables to Consider in Reducing Risk. Pediatrics. 2005;116 (5):1245-1255. 2. Von Kohorn et al. Influence of Prior Advice and Beliefs of Mothers on Infant Sleep Position. Arch Pediatr Adolesc Med. 2010; 164(4):363-369. 3. Colson et al. Barriers to Following the Supine Sleep Recommendation Among Mothers at Four Center for the Women, Infants, and Children Program. Pediatrics. 2006;118(2):243-250. 4. Willinger et al. Factors associated with caregivers’ choice of infant sleep position, 1994-1998: the National Infant Sleep Position Study. JAMA. 2000;283:2135-2142. 5. Brenner et al. Prevalence and predictors of the pron sleep position among inner-city infants. JAMA. 1998;280:341-346. 6. Malloy MH. 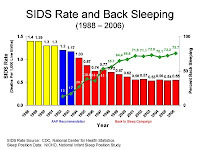 Trends in Postnaeonatal Apiration Deaths and Reclassification of Sudden Infant Death Syndrome: Impact of the “Back to Sleep” Program. Pediatrics. 2002;109(2):661-665. Sitting at my departure gate in a busy airport, I noticed a dad pushing through the crowd with a 6-month-old baby asleep on his shoulder and his 3-year-old daughter at his side. The trio looked exhausted as the dad maneuvered his daughter into one of the few empty seats at the gate. Two women were sitting next to me and the three of us stood up reflexively to offer them our seats. At first, the dad refused the offer but gave up quickly as the baby began to stir on his shoulder. He explained that they had been traveling across country since early morning and they were on the last leg of a 3-stop trip to join his wife in California. The adventure had been a tough one, full of crowds, irritated passengers, and no place in the men's rooms to change the baby. I'm sure it is no surprise to any of you, that we thought we should share some tips about flying on your own with your baby. 1. Do your homework before you leave for the airport. Many airports offer information online including the location of family restrooms (especially important for dads who may not find any accommodation for babies or other children in the men’s room). Be sure to find out where those restrooms are located in all of the airports on your route. Also, see if they have special (low pressure) lines for families at the security check points. Check with your airline for policies and rules related to family boarding, carry-on bags, car seats, and strollers. You don’t want to be stuck trying to consolidate your luggage or repackage liquids on the floor at the gate. Better to do some research before you leave your home. You may be a pro with collapsing your stroller and putting your baby in a carrier or sling when you have two hands but in a crowded airport with boarding passes in your hand, you might not have both hands free. Take the time to practice manipulating all of your traveling gear with one hand and/or with limited elbow room. 3. Dress yourself and your baby appropriately. Air travel can involve a lot of temperature changes as you pass through hot airports into cold planes and back again. Best to bring layers of clothing that can be easily added or removed. Don’t forget the metal detectors! Breeze through security by minimizing the metal that you wear (watches, jewelry, belt buckles, etc) or that might be on your baby (ditch the clothing with dozens of snaps or metal buckles). Make sure everyone has shoes that are easily removed and put back on again. 4. Keep your child close to you. For families traveling with toddlers, you want to take steps to make sure that your child does not move very far away from you. I’ve seen more than one family searching around in a panic after having lost sight of a young child in the crowd. While it is not likely that your child will go far, there are just too many opportunities for children to get hurt in airports. Keep your eyes open for hazards and your child in your arms or at your side. 5. When you have a choice, travel when your child is likely to be happy. I realize that we are all at the mercy of the airlines when it comes to departure times, but if you have the option, try to schedule flights to coincide with your baby’s happiest times of the day. If that isn’t possible, you might find it helps to fly at off peak times (usually late morning to mid-afternoon in the middle of the week). Smaller crowds and less pressure to hurry can help reduce your stress. While airports and airplanes are not known to be baby-friendly places, there will always be a few experienced parents or grandparents around who know what you are going through and who will be happy to lend a hand (or even 2!). 7. Watch for and address your baby’s disengagement cues. Airports are brimming with sights, sounds, and smells that may both excite and overwhelm your baby. Be ready to reduce all that stimulation by holding your baby close and/or bringing something to cover the stroller or car seat. Politely limit your baby’s interactions with strangers if you see your baby is tiring of all the fun. 8. Be prepared for your child’s discomfort. Flying can be particularly tough on babies and toddlers because they can’t move around very much during the flight and they feel unfamiliar and uncomfortable pressure in their ears during the landing. Swallowing can help reduce the pressure in babies’ ears so nursing or feeding babies as the plane descends can help but that isn’t always possible. Reassure and comfort your baby during the rough patches. Don’t worry what others say or do around you, just expect that your baby will need you and do your best to keep him as comfortable as possible. 9. Bring toys and other objects to distract or engage your baby. Toys that vary in color, size, and texture are more likely to hold your baby’s attention. Bring a variety of little used or new toys that you can rotate through on your trip. Save the toys that are most likely to interest your baby for the parts of the trip when your baby’s movement is restricted. It may help to bring something familiar and soft for your baby when he gets drowsy or unsure. Toys are not likely to help if your baby’s ears are uncomfortable. 10. Keep your sense of humor. Traveling with babies is tough even with 2 or more adults. With a good sense of humor, you can keep your cool, even with 2 or 3 layovers. It is well known that most adults are not going to be happy about having to sit near an infant in an airplane, some will ignore you and some will be rude. Don’t let these people upset you; you will never see them again. Just do your best and keep your focus on your baby. Being prepared and having realistic expectations will help you deal with the inevitable challenges that come with traveling with children. Good luck! Let us know if you have some great tips of your own to share. Next time: We’ll answer another reader’s question. Guess What? It's World Breastfeeding Week! All of us here at the UC Davis Human Lactation Center would like to send our best wishes to all of our readers who serve to promote, protect, and support breastfeeding mothers. This week is designated as World Breastfeeding Week (this always makes my son laugh) to celebrate all the work that is going on to assist mothers who have made the decision to breastfeed their babies. Of course, we also congratulate the moms who have ever breastfed or are breastfeeding! For more information on the history of World Breastfeeding Week and this year's theme, please click here. We'll be back next week with a slight detour in our planned posts. We're going to pass along some tips for moms or dads who must deal with the challenges of airline travel on their own with their babies. Next time: 10 Tips for Flying (on your own) with Baby! Last week, we posted 5 quiz questions. Here are the answers! 1. At what age do babies usually begin pretend/imaginary play? Answer: Research shows that pretend play begins between 12 and 18 months, although many experts agree that it is usually closer to 18 months. When pretend play begins, it can be hard to distinguish between imagination and imitation. For example, if a 12-month-old picks up a cup and puts it to her mouth, she could just be imitating what she knows others do with cups, rather than really imagining that she's drinking. 2. 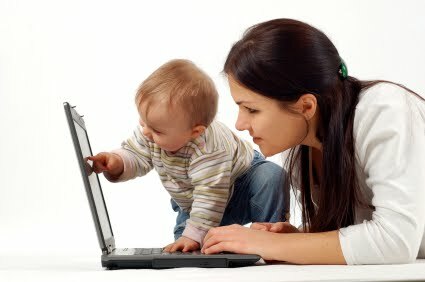 True of False: Recent research shows that babies and young children can not differentiate between reality and fantasy? Answer: False. Although early psychologists believed that young children were unable to tell the difference between real and imaginary, more recent research indicates that even very young children can tell the difference. Similarly, it used to be believed that young children spend so much time pretending because their brains are immature, but experts can now explain that the opposite is true. 3. True or False: Outgoing children are more likely to have imaginary friends than children who are shy? Answer: True. In addition, only children and older siblings are more likely to have imaginary friends than are younger siblings. Although having imaginary friends seems strange to most adults, it is very common and beneficial for young children. For example, children with imaginary friends have been shown to be better at predicting the feelings of others compared to children without imaginary friends. 4. How should babies be put down to sleep? Answer: B. Babies should always be put down to sleep on their backs. Putting babies down to sleep on their backs helps reduce the risk of Sudden Infant Death Syndrome (SIDS) and promotes brain development by increasing the amount of time spent dreaming. When babies are on their backs, they are more likely to wake up if they are having trouble breathing. Once your baby is able to roll over on his own, it is ok to leave him on his tummy if he rolls over in the night. 5. True or False: Eye color does not change after birth? Answer: False. Many babies are born with greyish colored eyes and the color tends to change over the first year of life. It has been suggested that almost half of young children experience lightening or darkening of eye color. If you have questions you'd like to see included in our next quiz, please send them to us. We'd love to hear from you! Next Time: We'll answer a reader's question about the risk of choking when babies are put down on the backs to sleep.